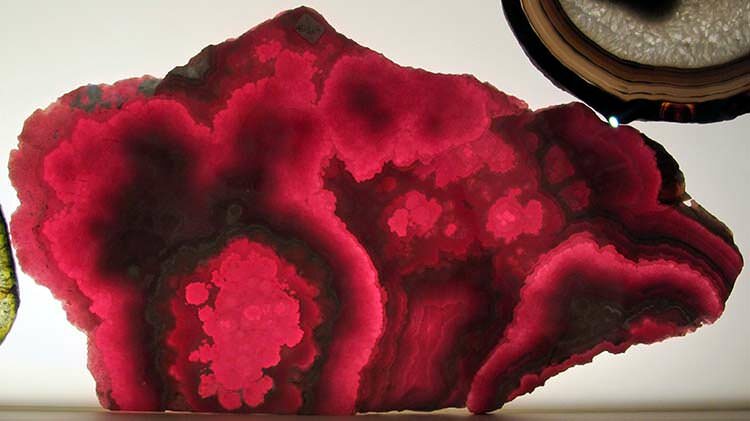 One of the most distinctive-looking gemstones you will ever see is rhodochrosite. This manganese carbonate mineral has the chemical composition MnCO3, and feature soft, rosy hues. The banded patterns it displays are similar to those you would find in malachite. The gem is also known by the colloquial names “Inca Rose” and “Raspberry Spar.” It is the state mineral of Colorado, and the national gemstone of Argentina. The more common form looks a bit like agate, and features alternating stripes in various hues of light and dark pink. Other colors may also be present, such as vermillion, brown, gray, and white. Like agate, it tends to be opaque or translucent and opaque. If you are familiar with the banded appearance of malachite, then you know more or less what this form of rhodochrosite looks like. You will see the same distinct formations of concentric circles if the piece is cut in the same direction as the bands. If the piece is cut across the bands, you will see the stripes. 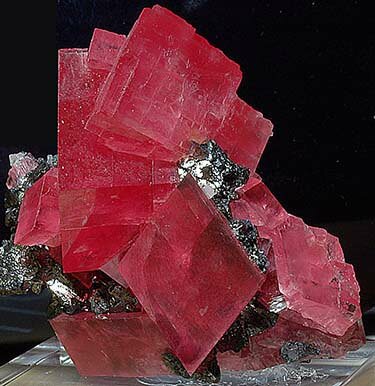 The other form of rhodochrosite is a great deal rarer, and that is the translucent or transparent red variety. This type of rhodochrosite looks glassy and can exhibit stunning clarity and depth of color. 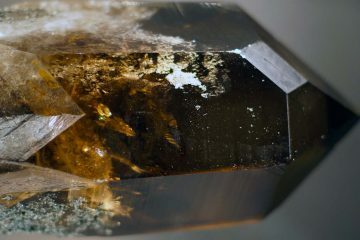 It tends to form in large square crystals, but may also form in terminated crystals. Most of the images on this page are of this variety as they are quite spectacular. 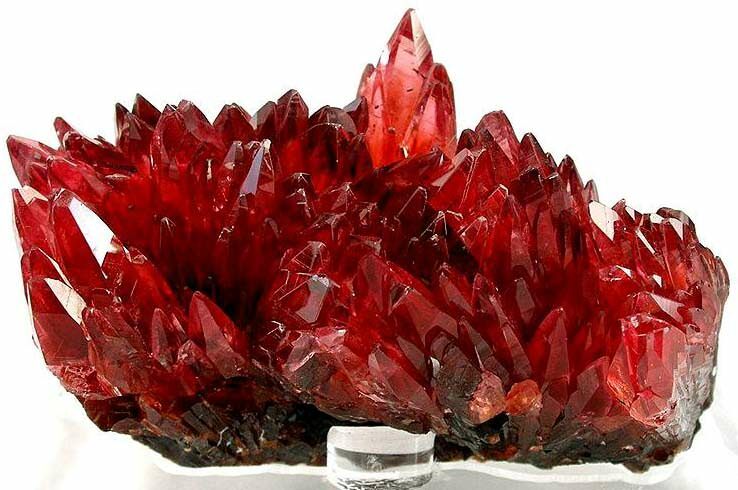 The famous deep red clear crystals have been found in Hotazel, the Kalahari Manganese fields of South Africa, and also in the N’Chwaning Mines of Kuruman. 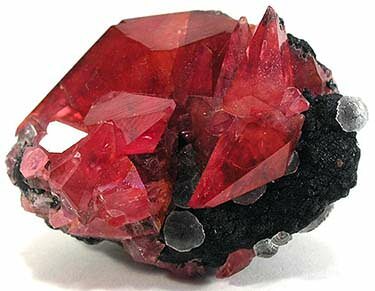 Dark red crystals have been discovered in Gabon in the Moanda Mine. 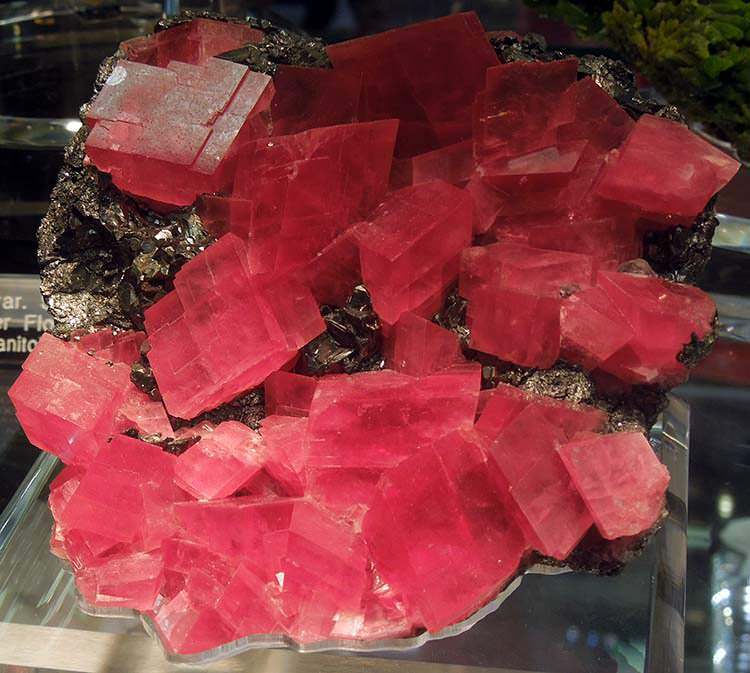 Other large gem-quality crystals have been discovered in the Sweet Home Mine outside of Alma, Colorado, including the famous “Searchlight” gemstone (seen further down this page) and the “Alma King.” The Alma King is the largest rhodochrosite ever discovered, and is currently displayed at the Denver Museum of Nature and Science. 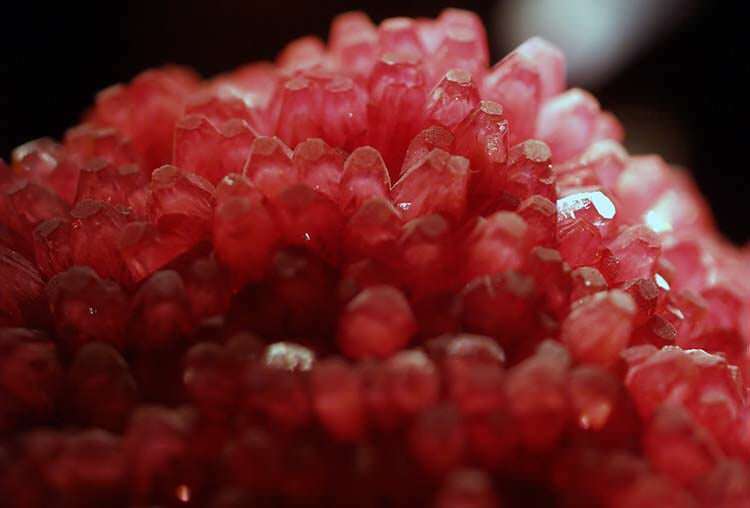 Rhodochrosite is a brittle gemstone which only rates a 3.5-4 on the Mohs scale of hardness. For comparison, fluorite is a 4 and calcite is a 3. This is not very hard at all. Rhodochrosite breaks when dropped, and may scratch or chip quite easily. Rhodochrosite may exhibit fluorescence, meaning it may glow when you expose it to UV light (seen further down this page). This tends to be a property of the dark red pieces. Some stones may also oxidize in contact with the atmosphere, darkening over time. 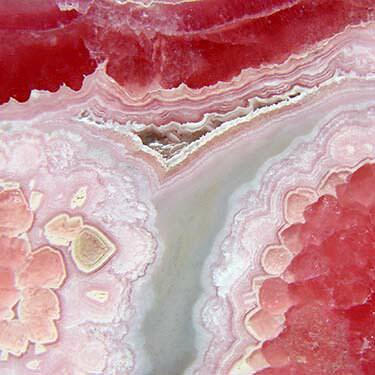 As mentioned previously, rhodochrosite can be found in variegated hues of pink, red, white, gray, brown, and vermillion. The rosy hues of medium and pale pink which are most common are the result of calcium substituting in varying amounts for manganese. It is the deep red pieces however which are most prized and which fetch the highest price on the market. While some rhodochrosite is gem-quality, a lot of it is not. It does however have an important industrial use. 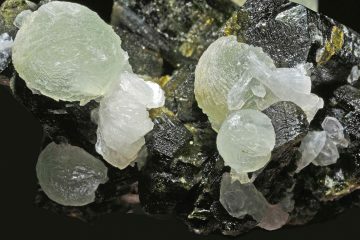 It can serve as an ore for extracting manganese. 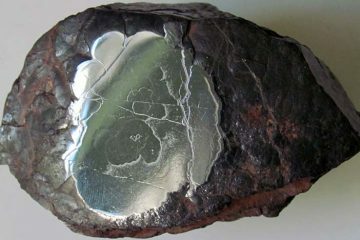 The manganese is used in aluminium alloys as well as in the production of low-cost stainless steel. 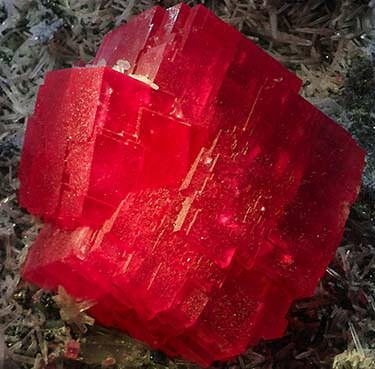 It is also interesting to note rhodochrosite’s role in mining. Manganese carbonate is detrimental to the process of amalgamation. For that reason, miners tended to discard rhodochrosite when they encountered it in the mine dump before it was realized that some pieces might be gem quality and that they could fetch a high market value. This is enough to make you wonder how many beautiful, valuable rhodochrosite gemstones were thrown aside simply because the miners didn’t know better! When you are shopping for rhodochrosite, you can expect to pay a pretty penny, because rhodochrosite is a relatively uncommon gemstone. The cost will depend on whether you are shopping for the deep red, transparent variety of the gemstone or the pink, banded variety. What about the four Cs? Whether they apply or not depends on which type you want. The clarity of rhodochrosite will not matter at all if you are shopping for the banded pieces, but it will be very important if you are shopping for the transparent type. Cut will also be irrelevant with banded pieces, since they will almost always be tumbled and polished. You will however find some faceted pieces of transparent rhodochrosite. These pieces still tend to display a lot of flaws, but the right cut may help to conceal them. Carat is important: the heavier the piece, the more valuable it will be, all other factors being equal. 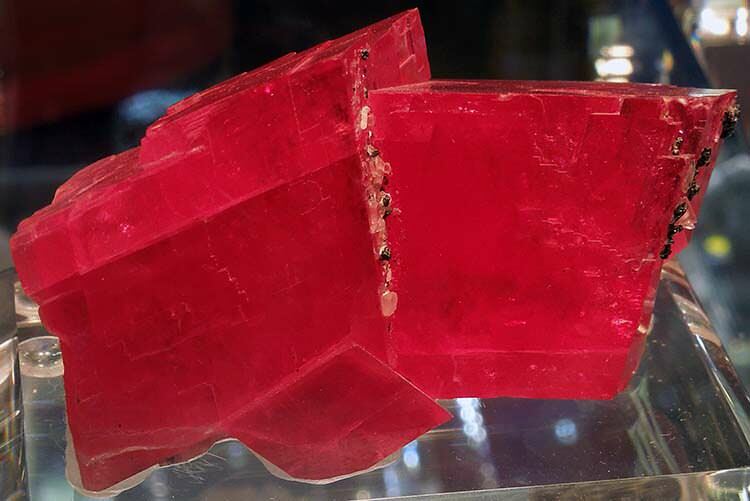 Along with transparency, color is the most important aspect determining the value of any given specimen of rhodochrosite, so pay close attention to that when you are shopping. Many pieces of rhodochrosite are carved into shapes, so craftsmanship is one more factor which may impact the value of a finished piece. Many collectors are not looking for polished or faceted Rhodochrosite, however, and are actually shopping for raw stones. Rhodochrosite specimens that exhibit particularly stunning crystal growth or banded patterns may fetch a higher price owing to their unique natural beauty. Trying to rate the value of rhodochrosite according to color is no simple task. For most gemstones, the deeper and darker its color, the higher its cost. That is not the case with rhodochrosite. The pale pink pieces are some of the least valuable, just as you would expect, but the highest cost is not commanded by the deepest, darkest pieces. Instead, it is those with the most vibrant medium hues which will run the highest cost. Medium dark red: $204 per carat. 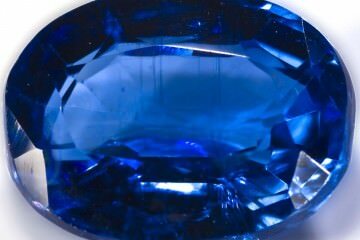 This is one of the very few gemstones you will find with such unusual valuations. The dark, deep red which would normally be the most valuable color with other types of gemstones is actually graded as the least valuable. The valuations of the light and medium pink are not unusual, nor the high value assigned to the medium red. The fact that the medium orangey red stones fetch the highest price by far though is a surprise. This is a testament to that color’s rarity. Remember, when you are selecting a rhodochrosite gemstone, your recipient’s personal taste should influence your buying decision. A translucent piece of orange-red rhodochrosite may cost more, but your recipient may prefer a less expensive banded piece in light pink. The only way to know is to ask. You will very rarely find faceted rhodochrosite jewelry. The opaque, banded look of rhodochrosite translates poorly to faceting, which only serves to emphasize the lack of clarity. The glassy, transparent pieces are sometimes faceted, but they display a lot of inclusions, even at the highest quality. Rhodochrosite jewelry is almost always tumbled and polished into beads or cabochons. Polishing and tumbling beautifully displays the bands and concentric rings. Sometimes pieces are carved into whimsical shapes. It is rare for rhodochrosite to be used for engagement rings for a couple of reasons. First off, it is far from traditional since you usually cannot facet these pieces to a good effect. Most people don’t want tumbled stones in their engagement rings. Secondly, rhodochrosite is very brittle, and is not the best stone for everyday wear. Still, you will find a few rhodochrosite engagement rings out there featuring polished stones. The bands are typically accented with small diamonds. Rhodochrosite is a beautiful gemstone that you can purchase in a wide range of astonishing, vivid colors. Both the translucent stones and the banded specimens are gorgeous, and make a unique fashion statement. A rhodochrosite wedding ring is truly one-of-a-kind and makes an excellent conversational statement piece. The high value of rhodochrosite adds to the meaningfulness of this gemstone as a gift. Just as the high cost of a diamond symbolizes commitment, the high price of rhodochrosite also speaks to the same. Rhodochrosite is rare, and finding a great specimen may be challenging, especially if you are in search for the deep red translucent variety. Even at its most clear, rhodochrosite is far from flawless. You will usually see inclusions even in the best pieces. For that reason, it is hard to facet rhodochrosite and get a great effect. This also may not make it the ideal choice of something like an engagement ring, where you usually want a bit of sparkle. This gemstone is far from traditional. That is why most recipients will not prefer it for an engagement ring. Probably the biggest drawback with rhodochrosite for jewelry is its fragility. Something rating only a 3.5-4 on the Mohs scale of hardness can chip and fracture easily. This means that it is not the most suitable gemstone for everyday wear. Cleaning rhodochrosite: This is something you have to be extremely careful with. The problem with cleaning this gemstone is that it is so low on the scale of hardness that even dust can scratch it! So you do not ever want to just try to wipe dust right off of it while the stone is dry. Instead, rinse the stone off so that the water takes away the dust. Then you can rub it very gently with a soft cloth and some very mild detergent. Rinse it again and make sure that no soapy residue remains anywhere on the stone! At that point, you should let the stone air dry. Never use an ultrasonic or steam cleaner or any harsh chemicals on this stone! Storing rhodochrosite: It takes almost nothing to scratch this soft mineral, so do not store it with the rest of your gemstones and jewelry. Place it inside a fabric lined box or pouch of its own. Keep it in a cool, dry place. Excessive heat may damage the stone, so you do not want to leave it out in the sunlight. Wearing rhodochrosite: Because rhodochrosite is so easy to damage, you should never wear it while you are doing any work with your hands, and you should take it off before doing anything athletic. Always wait to put it on until after your beauty routine so you do not get any harsh chemicals from makeup or hair products on the gem. 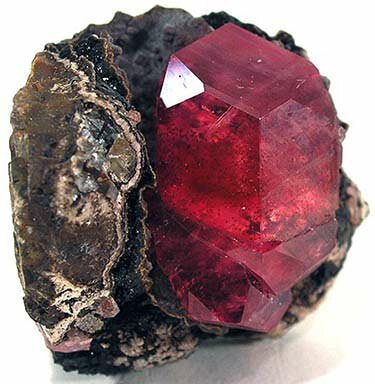 The first mention of rhodochrosite dates back to 1813. The specimen was discovered in Romania. As mentioned earlier, a lot of these gemstones were discarded as worthless by-products in silver mining for some time before gemologists realized that the stones could be quite spectacular. At that point, the value of rhodochrosite was finally realized, and collectors and jewelers began to take an interest in the stone. 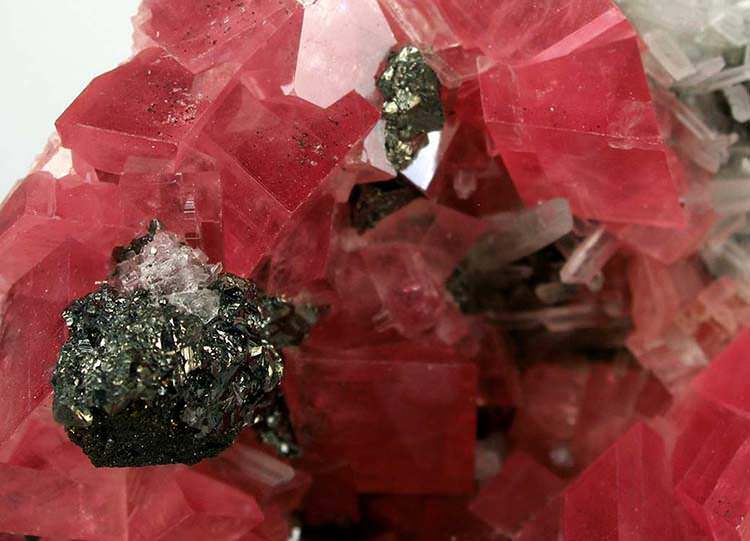 In 2002, the Platte Canyon High School in Bailey, Colorado, proposed to the state legislature that rhodochrosite be named the state mineral. Because many of the most prized and beautiful rhodochrosite gems have come from the Sweet Home Mine outside of Alma, CO, the gem had become closely linked with the state. 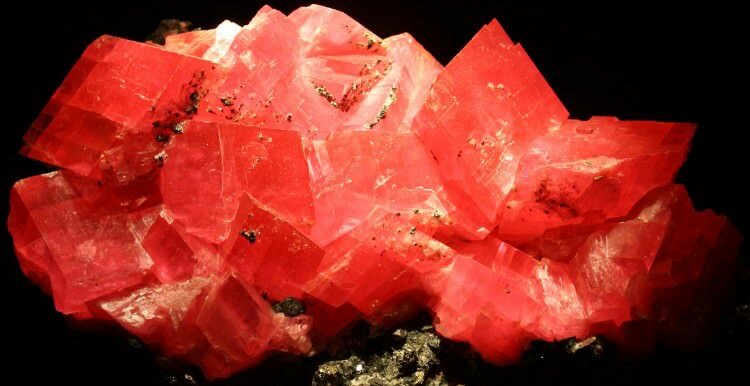 The proposal was approved, and rhodochrosite was selected as the official state mineral. Because rhodochrosite’s colors typically range anywhere from pink to red, the stone may be associated with either the heart chakra (typically represented by either green or pink), or the root chakra. These associations have informed the meanings which are typically connected to the stone. Rhodochrosite is seen as a very nurturing, soothing, tranquil gemstone, perfect for opening up the heart and healing loneliness and grief. Because rhodochrosite is also linked to the root chakra, it is considered a grounding and centering stone. This would make it a perfect choice to wear during times of emotional distress. It can boost your confidence and can help you to face your problems in a balanced manner. 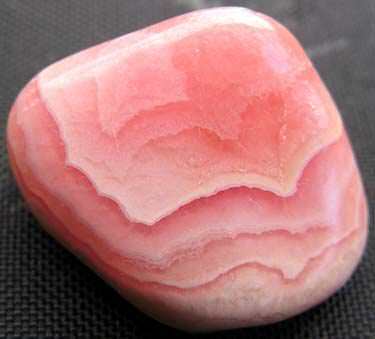 Rhodochrosite is placed in the southwest part of a room in Feng Shui to cultivate love and healing in relationships. It may be placed anywhere in a room to ease a transition in any area of life. A short interview with the owner of the only mine in the world that produces banded rhodochrosite. 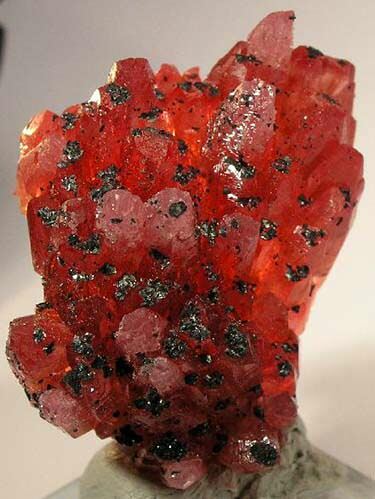 It features some beautiful examples of this type of rhodochrosite. While rhodochrosite is quite a distinctive gemstone, there are a number of other gemstones which feature some similarity in appearance and properties. Rhodonite: This gemstone has a similar-sounding name, and likewise occurs in pink. The crystal structure is different however, and the gemstone is significantly harder, around 5.5-6 on the Mohs scale. Whereas rhodochrosite forms with lighter pink and white bands, in rhodonite, you will typically see black bands. You will also observe a different (and very distinctive) texture. The color is also a cooler shade of pink on the spectrum. Rhodochrosite has a warmer hue. Pink calcite: This gemstone may be easy to mix up with rhodochrosite. 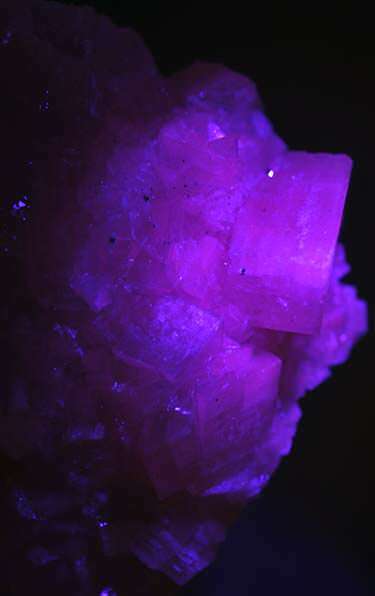 It forms pink crystals, sometimes with a similar-looking structure. Like rhodochrosite, it may even form with lighter and darker bands of pink and white. Pink calcite tends to be paler and closer to white, but not in every case. Often it can be recognized from its smooth, glassy texture. It also effervesces when exposed to hydrochloric acid. Pink dolomite: This stone may feature similar shades of warm, light pink. It is most easily recognized in its raw form. Its crystals form in a unique curved shape which is quite distinctive from how rhodochrosite forms. Carnelian: Carnelian is generally easy to tell apart from rhodochrosite, but it features a warm vermillion hue similar to the medium orange-red that is so sought after in rhodochrosite. Unlike rhodochrosite, carnelian frequently forms with this color, which is typically bold, rich, and deep. Carnelian is usually translucent to opaque, whereas rhodochrosite stones that actually feature this rare color tend to be more glassy and transparent (though still heavily included). Malachite: Why include malachite in this list? You will certainly never mix it up with rhodochrosite, since rhodochrosite is pink and malachite is a vivid, unmistakeable green. The two stones form similar crystal structures, however, and ignoring the color, they are remarkably alike in appearance. Agate: Agate, like malachite or rhodochrosite, forms those same distinctive circular “eyes” and bands which are so recognizable. You may occasionally encounter agate stones with pink hues in them, but most pink agates have been dyed. The majority of these dye jobs are fluorescent pink and impossible to mistake as natural coloring. Rhodochrosite may not be the world’s best-known gemstone, but it is definitely one of the most beautiful. If you know someone who loves pink and enjoys tumbled and polished gemstones featuring lovely bands of color, rhodochrosite makes a wonderful gift.